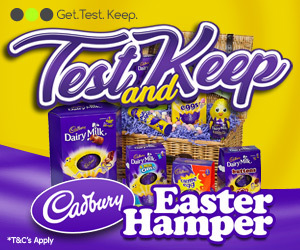 GetTestKeep are looking for testers to test Cadbury's Easter Hamper. Feed your chocolate addiction with a fabulous Cadburys Easter Hamper overflowing with scrumptious and tasty sweet treats. Your hamper will contain an assortment Easter Eggs, Chocolate bars, Mini eggs and much much more!! Why not apply today for your chance to win and give in to the chocoholic inside!